Home Costs > How Much Does Staining a Fence Cost? How Much Does Staining a Fence Cost? Staining a fence may be necessary if you just installed a new fence or in the case of a fence that’s starting to show off its age. Whether you want to stain it on your own or hire a professional contractor, a few factors need to be considered in order to figure out an estimate. If you plan on hiring a professional to stain the fence, plan on spending anywhere from $0.25 to $1 per square foot for a fairly straightforward job. The cost will depend on the size of the job, the size of the fence, the prepping required, the contractor performing the job, the type of stain, and geographical location. Other companies may charge by the panel or linear foot. If this were the case, plan on spending $10 to $17 per panel or up to $1.50 to $2.50 per linear foot of fence to be stained. If you want to get an exact quote for your particular job, we highly recommend HomeAdvisor.com, a free service that connects you with locally licensed contractors. Here, you simply describe your job and contractors will contact you with free, no-obligation quotes. Those who plan on doing the job on their own should be prepared to spend $25 to $45 per gallon of stain. The average gallon can cover up to 300 square feet. A forum member on this TexasHuntingForum.com forum thread stated that they charged $0.28 to $0.35 per square foot to clean and stain a fence. LoneStarFenceStaining.com, a professional staining contractor located in San Antonio, Texas, charges $0.25 to $0.35 per square foot, according to their official price list. They charge based upon the condition of the fence and stain you choose. Before the fence is stained, a contractor will first clean and prep the area, which can take up to three days for the fence to dry. If the fence has to be re-stained, all boards will be inspected, and if any of the boards have to be replaced, then either a new panel or board will be installed. Once the fence is prepped and all of the boards are considered to be in good condition, the stain will be applied. Most of the time, one coat of stain will be more than enough. A good stain will be transparent and water-resistant, protecting the wood from moisture. If a piece of wood is stained, you should be able to see water bead up rather than soak in. A good stain should last a minimum of two years. Additional fees can apply if the wood has to be sanded down. If any of the boards have to be replaced, additional fees can apply. Contractors who have to travel outside of their 25-mile radius may charge a mileage surcharge. If you are going to stain the fence yourself, you will need supplies such as paint brushes, rollers and the paint pans. There are some companies that offer power washing before the fence is stained. This will get rid of any dirt or debris and can also be used to strip the old stain from the fence. This will also make the job take longer, however, because the fence will need a minimum of 24 hours to dry out before the stain can be applied. 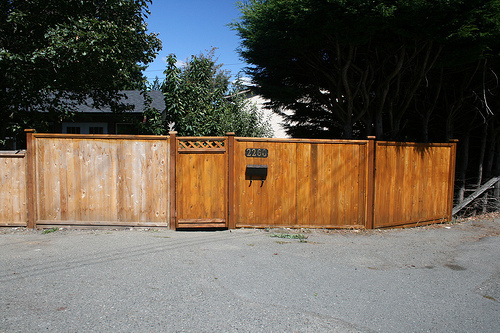 When a contractor washes the fence before staining, they will allow it to dry for up to three days. As long as the weather stays dry, most jobs can be completed within a week. Those who plan on staining a fence on their own should highly consider a premium product. Do not skimp on the stain when choosing your product. Failing to choose a good product will only mean you will have to re-stain it quicker in the future. Do not use a pressure washer on wood since this can do damage. Instead, use a garden hose to gently remove any dirt or debris. Some professional suggest you stain rather than paint a fence. “Wood absorbs the stain much deeper than it does paint. This means that paint, when it gets old, starts to chip, peel, and appear careworn, requiring near-immediate attention as soon as it starts to show signs of wear and tear. By contrast, the stain will simply fade over time.” They also remind people that the stain does not have to be brown. There are many different colors and shades of stain that can protect your fence while giving it the color to compliment your home. When hiring any professional contractor, always make sure that you get at least three to five quotes. However, do not just focus on the pricing. Make sure that you get references, see that they are insured and try to talk with customers who they have worked with in the past. The more you know about the contractor, the more confident you can be with the hire. Staining a fence is not a hard job at all. If you have the time, consider doing the job on your own. By doing it yourself, you can potentially save hundreds, if not thousands depending on the size.